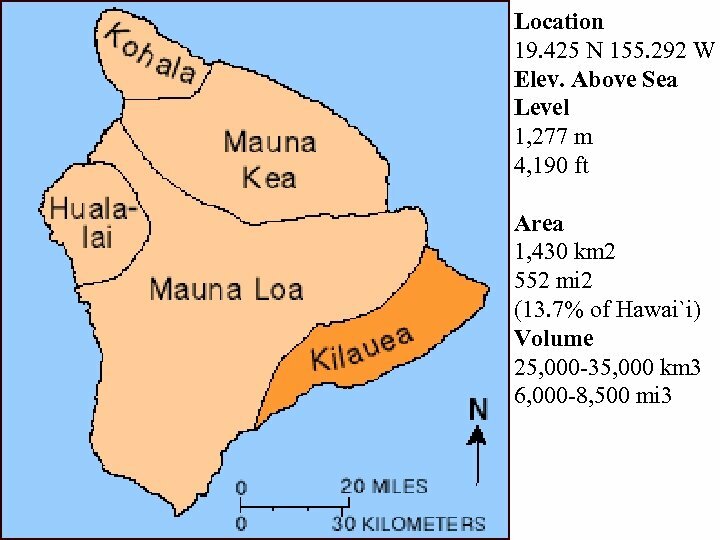 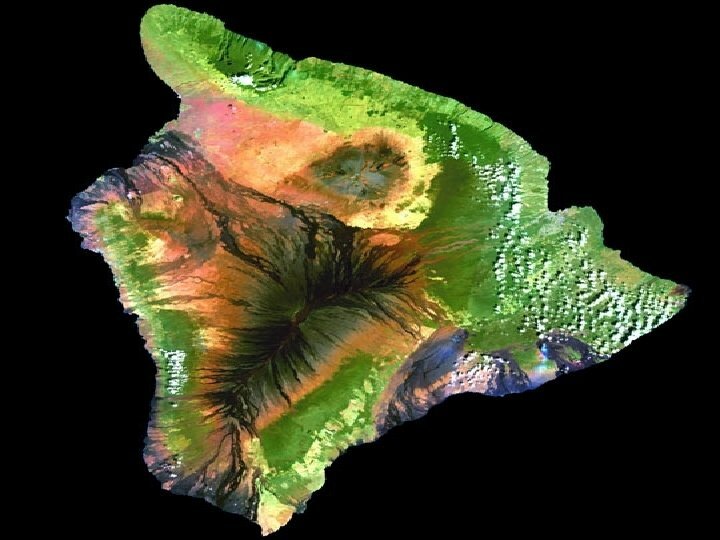 The island of Hawaii is divided into zones according to the degree of hazard from lava flows. 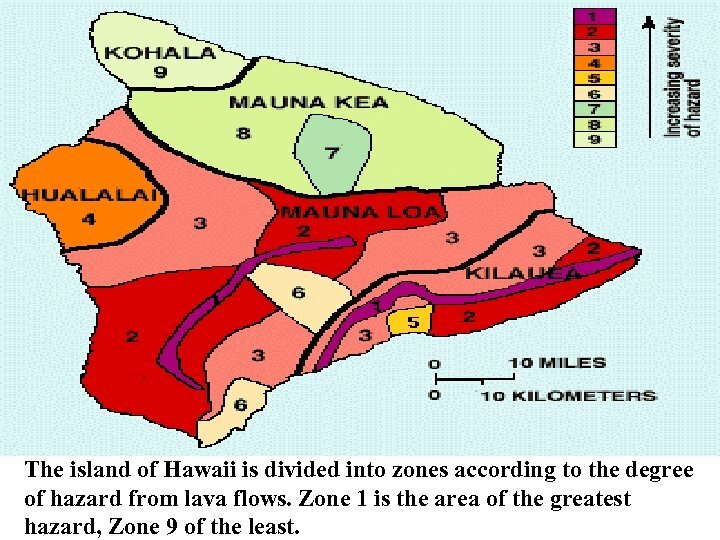 Zone 1 is the area of the greatest hazard, Zone 9 of the least. 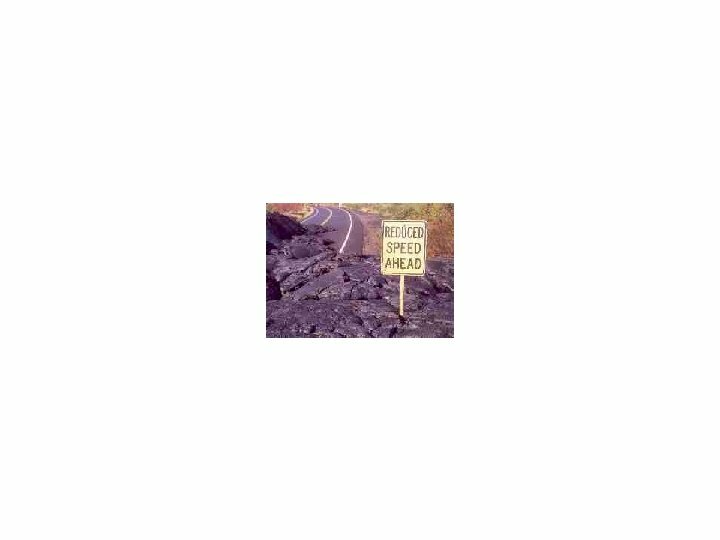 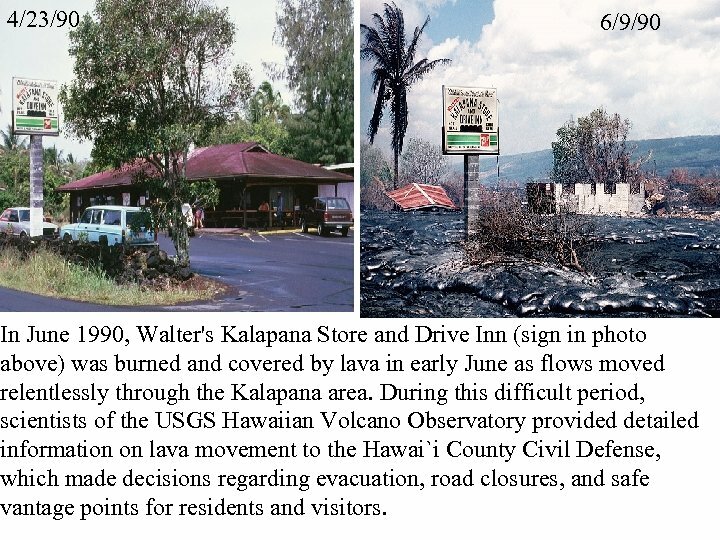 4/23/90 6/9/90 In June 1990, Walter's Kalapana Store and Drive Inn (sign in photo above) was burned and covered by lava in early June as flows moved relentlessly through the Kalapana area. 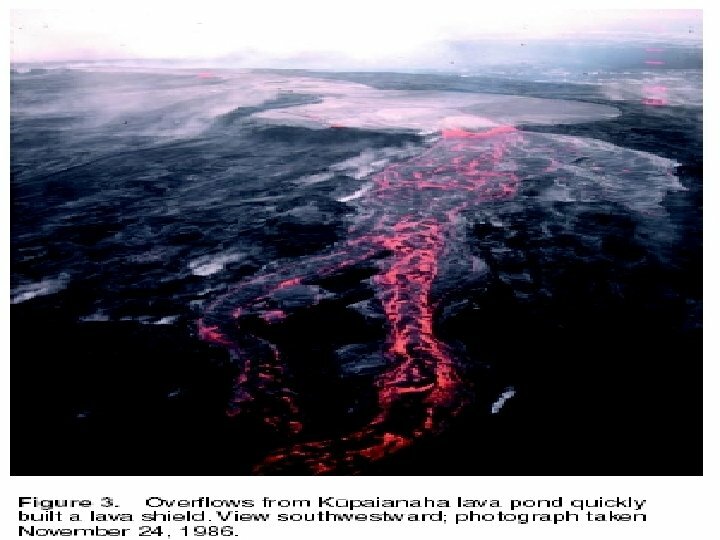 During this difficult period, scientists of the USGS Hawaiian Volcano Observatory provided detailed information on lava movement to the Hawai`i County Civil Defense, which made decisions regarding evacuation, road closures, and safe vantage points for residents and visitors. 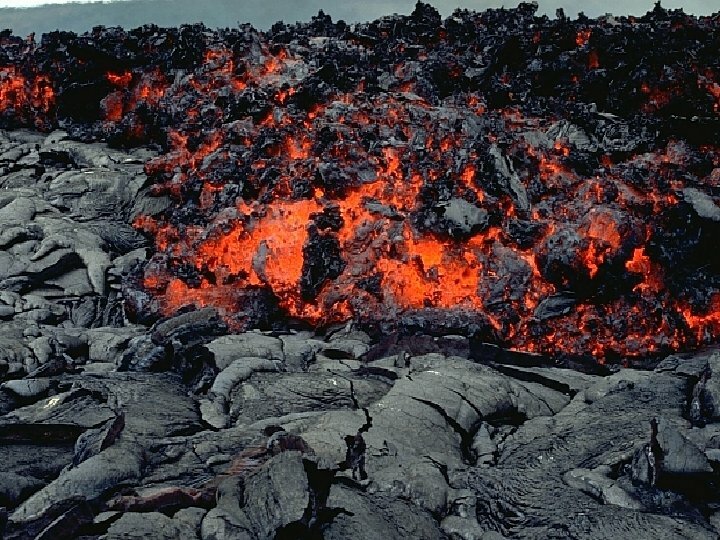 Lava Tubes on Mt. 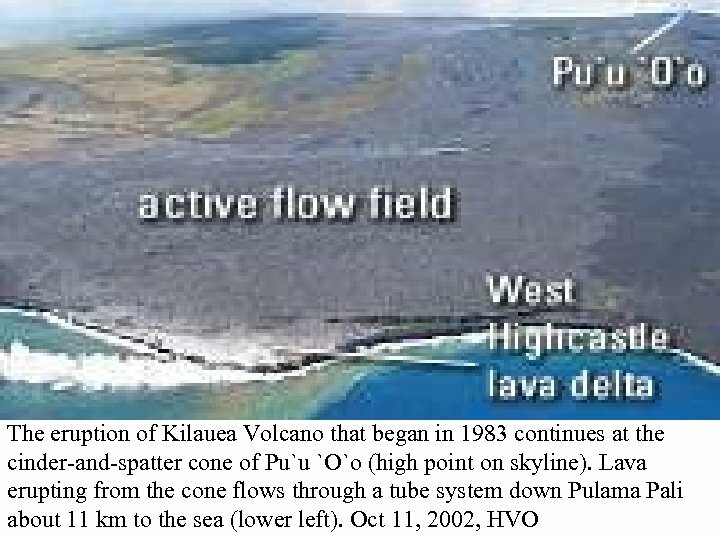 Kilauea's caldera is located toward the northwestern corner (upper left) of the image. 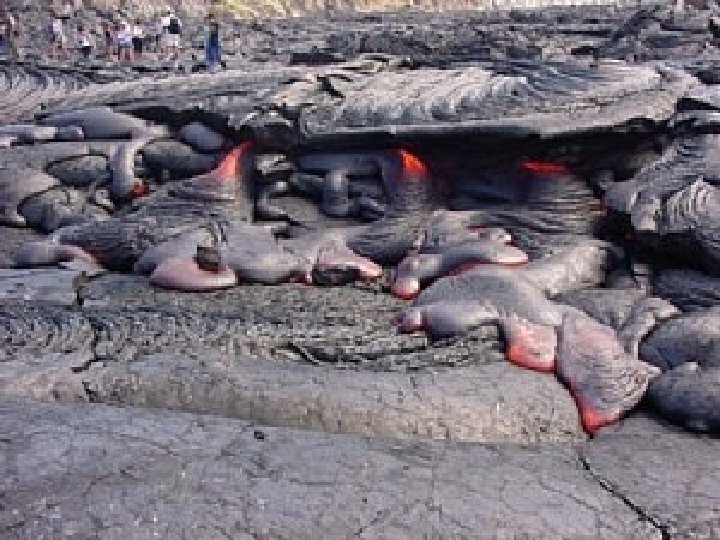 The brown hues show volcanic rock, while dark browns and black show relatively recent lava flows that have cooled and solidified into rock. 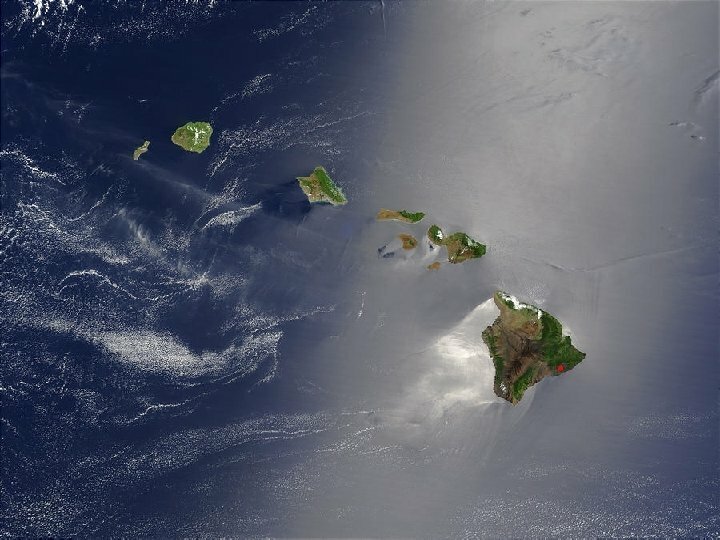 The green hues show forest canopy, white pixels are clouds, and the blue to the south and east is the open Pacific Ocean. 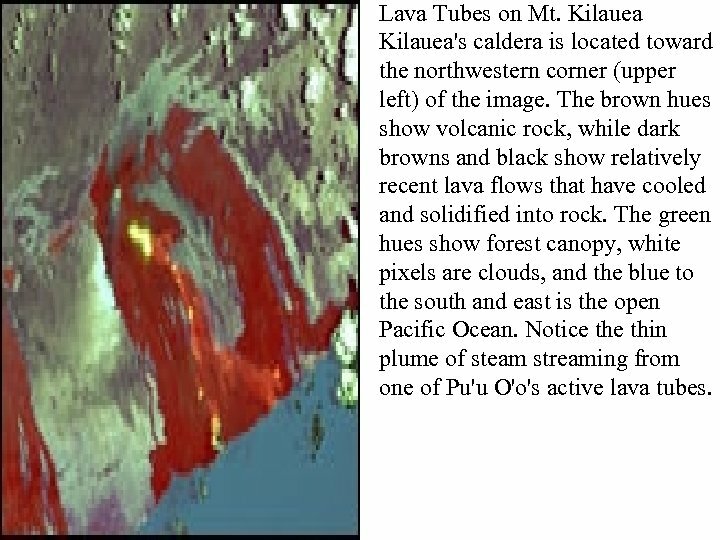 Notice thin plume of steam streaming from one of Pu'u O'o's active lava tubes. 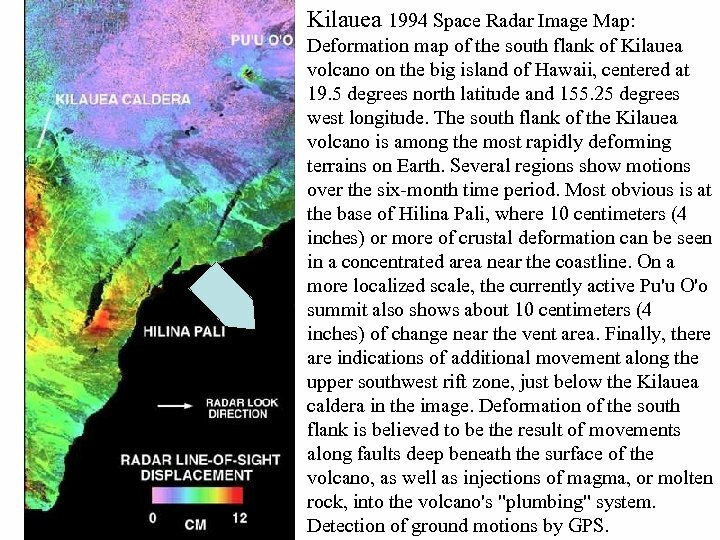 Kilauea 1994 Space Radar Image Map: Deformation map of the south flank of Kilauea volcano on the big island of Hawaii, centered at 19. 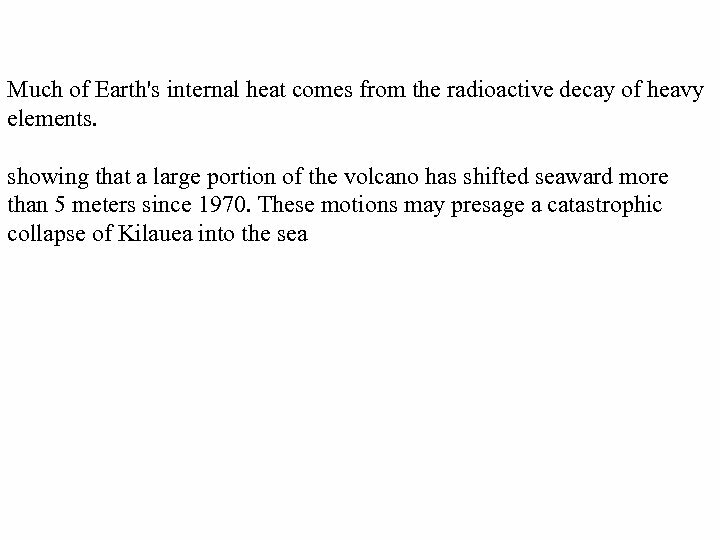 5 degrees north latitude and 155. 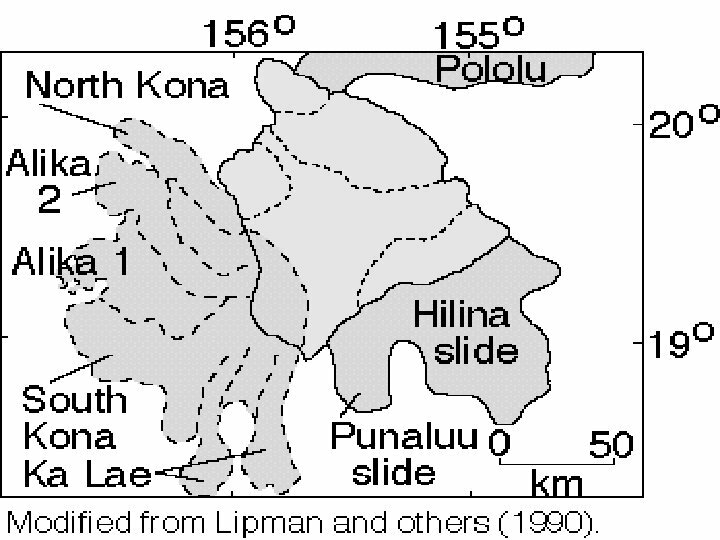 25 degrees west longitude. 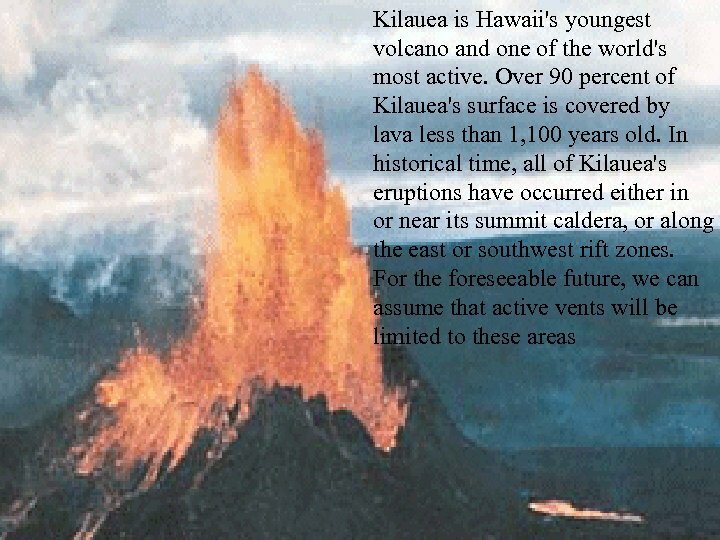 The south flank of the Kilauea volcano is among the most rapidly deforming terrains on Earth. 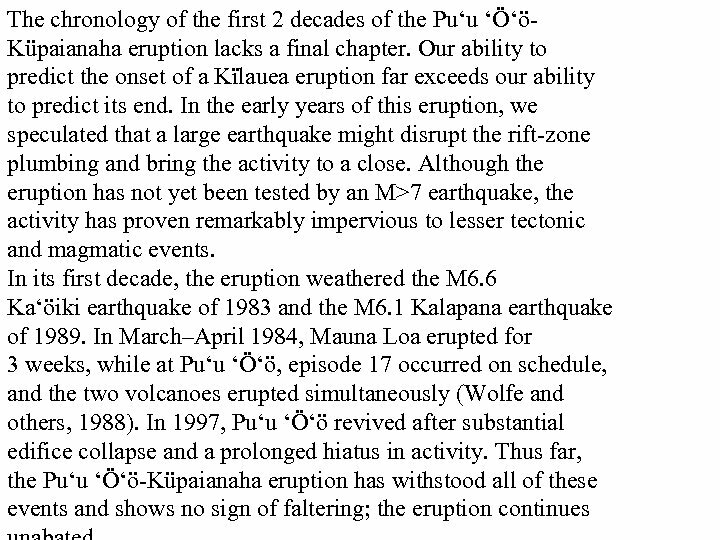 Several regions show motions over the six-month time period. 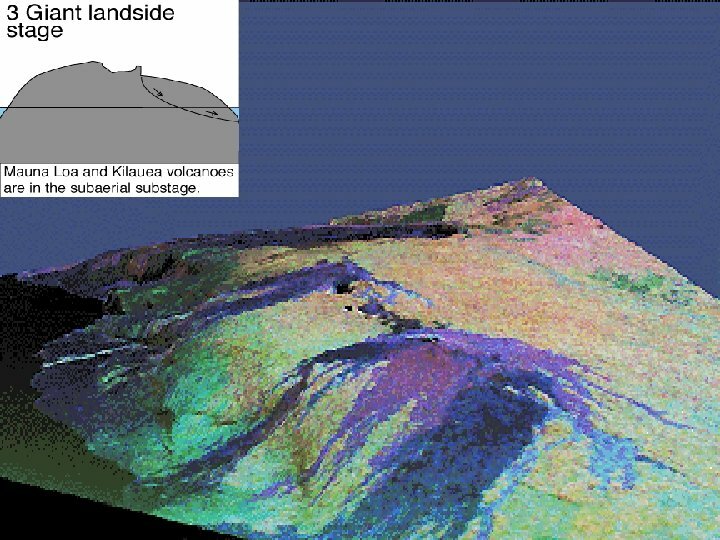 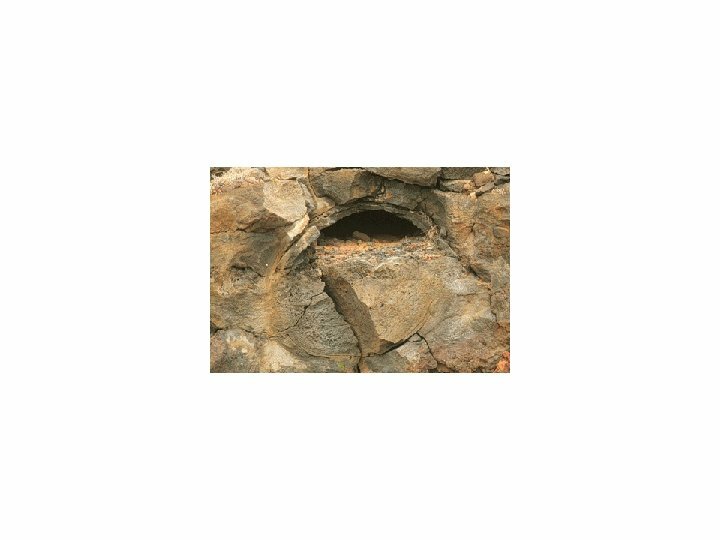 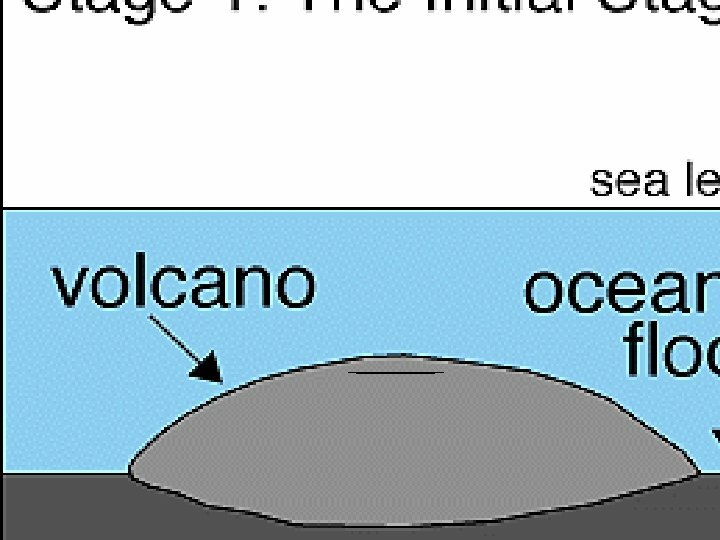 Most obvious is at the base of Hilina Pali, where 10 centimeters (4 inches) or more of crustal deformation can be seen in a concentrated area near the coastline. 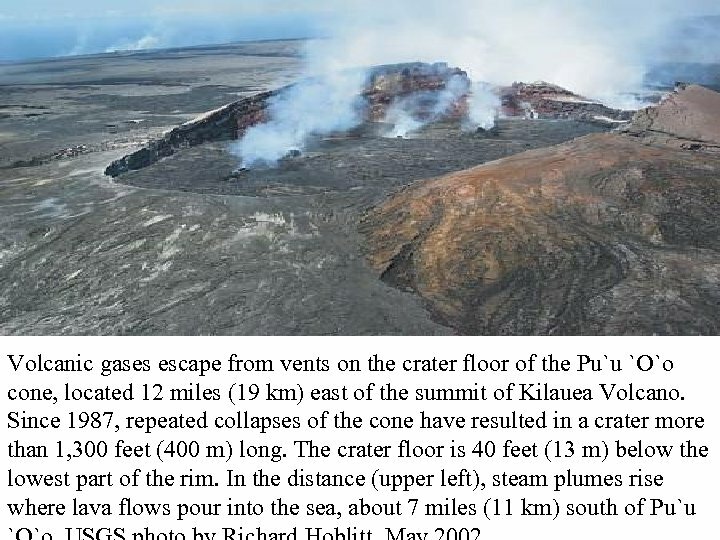 On a more localized scale, the currently active Pu'u O'o summit also shows about 10 centimeters (4 inches) of change near the vent area. 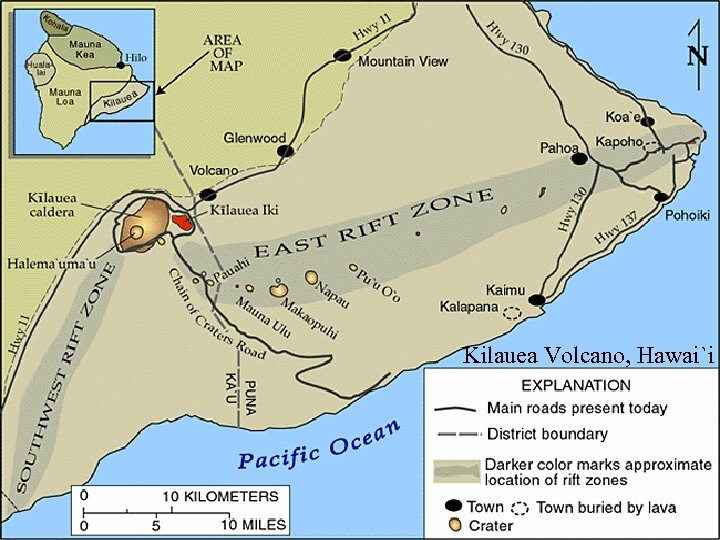 Finally, there are indications of additional movement along the upper southwest rift zone, just below the Kilauea caldera in the image. 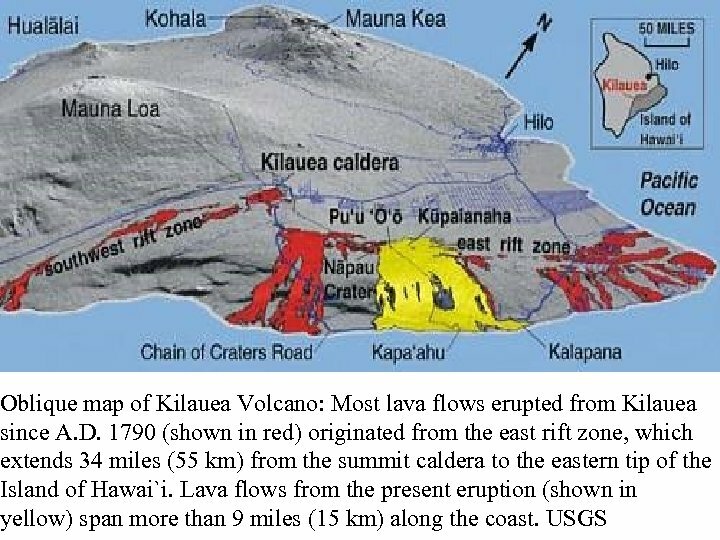 Deformation of the south flank is believed to be the result of movements along faults deep beneath the surface of the volcano, as well as injections of magma, or molten rock, into the volcano's "plumbing" system. 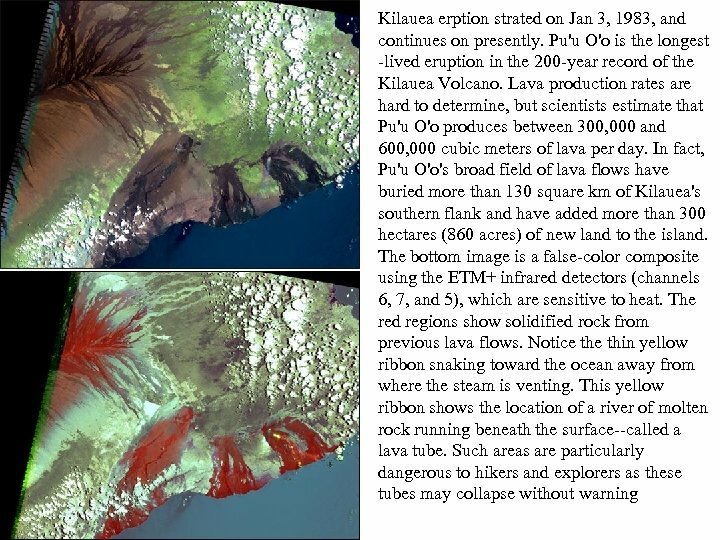 Detection of ground motions by GPS. 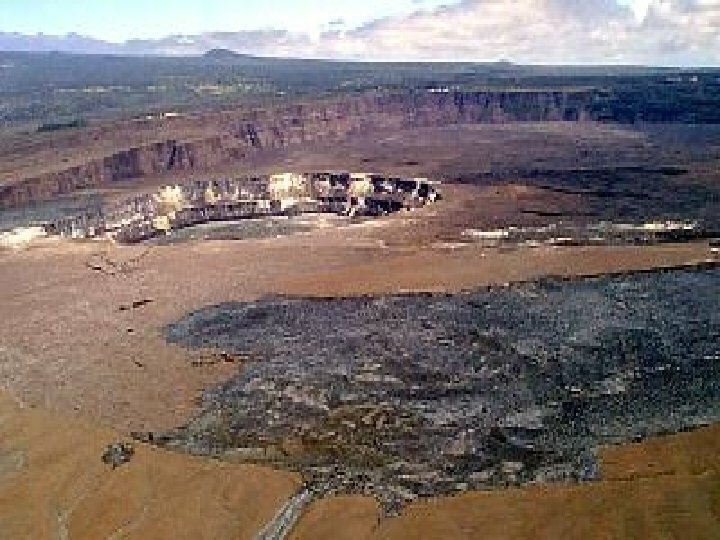 Kilauea volcano, which overlaps the east flank of the massive Mauna Loa shield volcano, has been Hawaii's most active volcano during historical time. 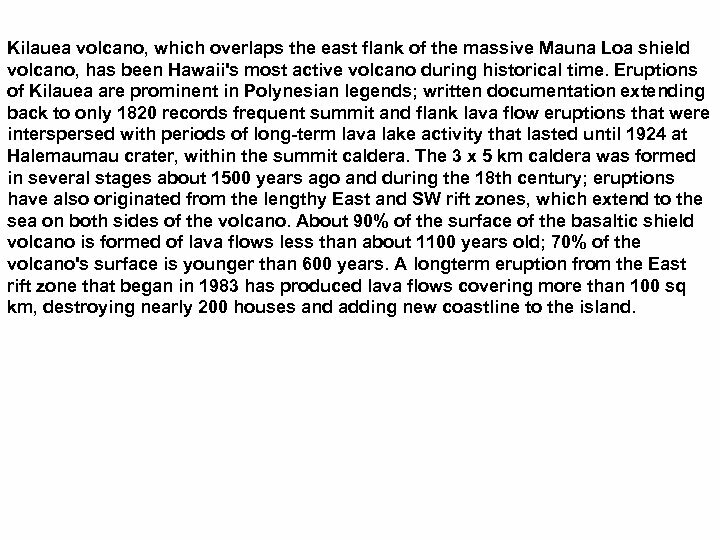 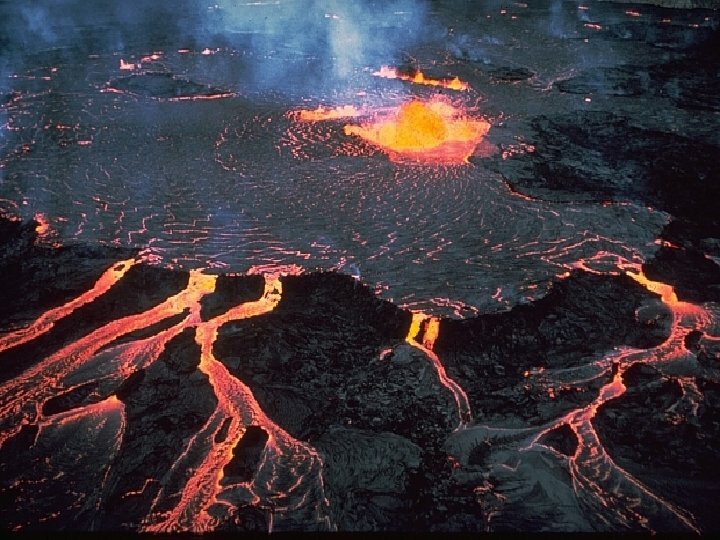 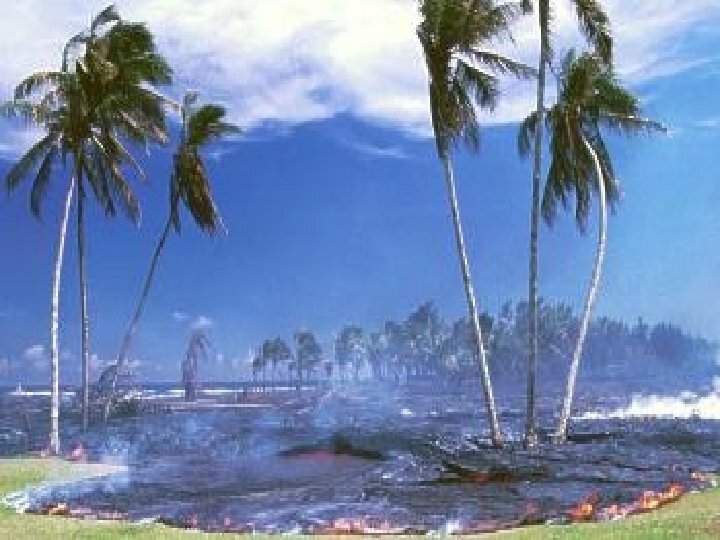 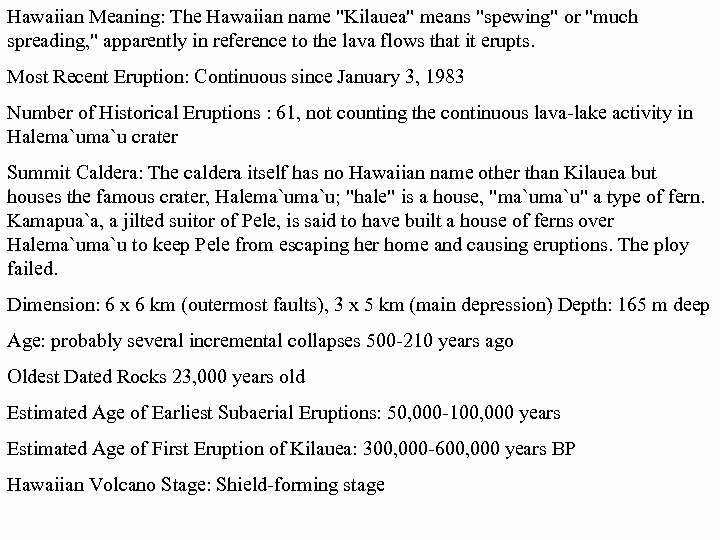 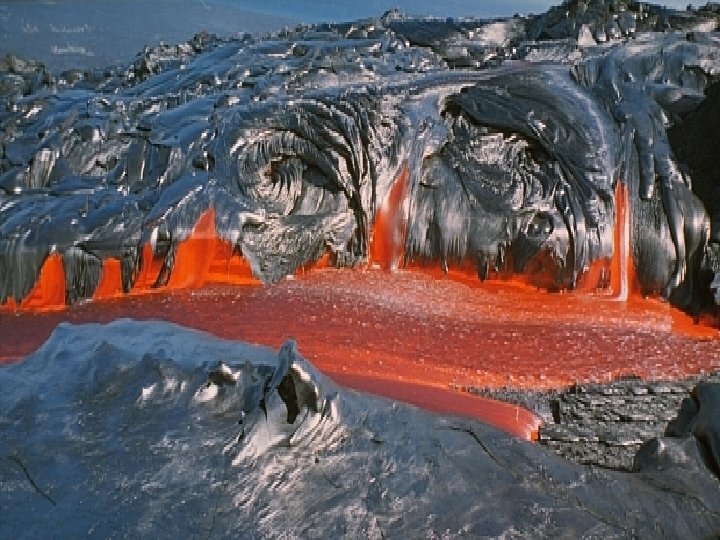 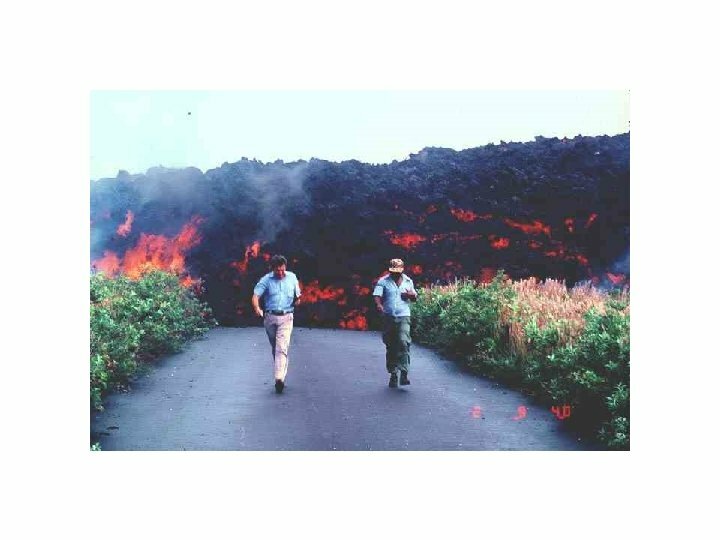 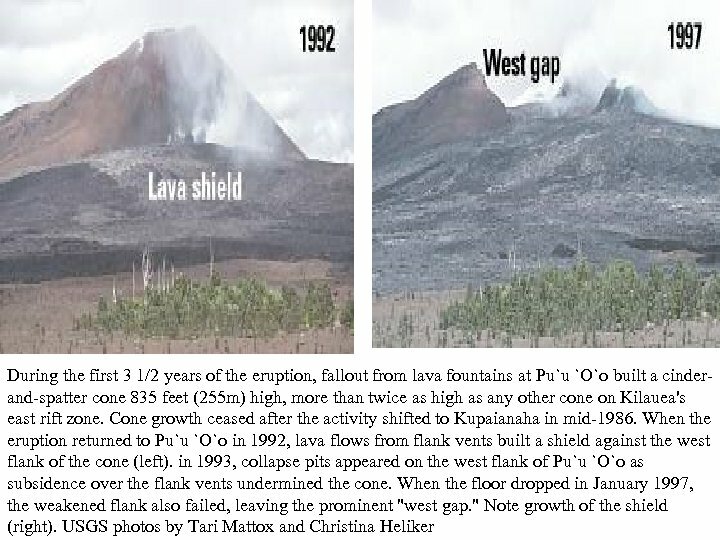 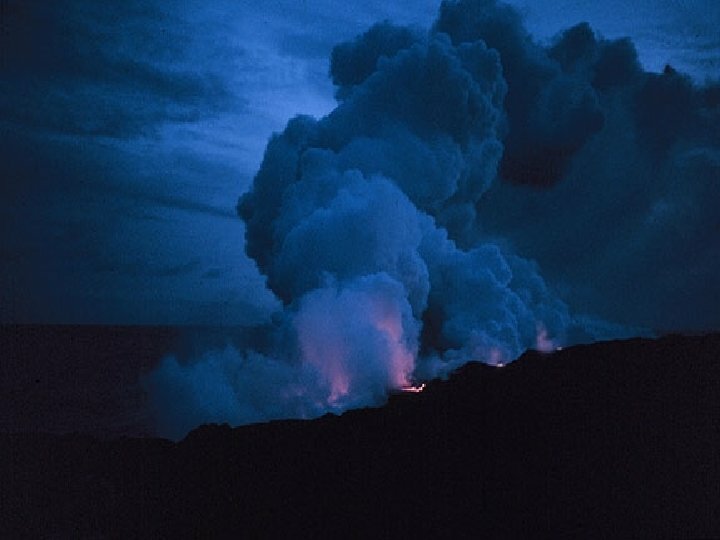 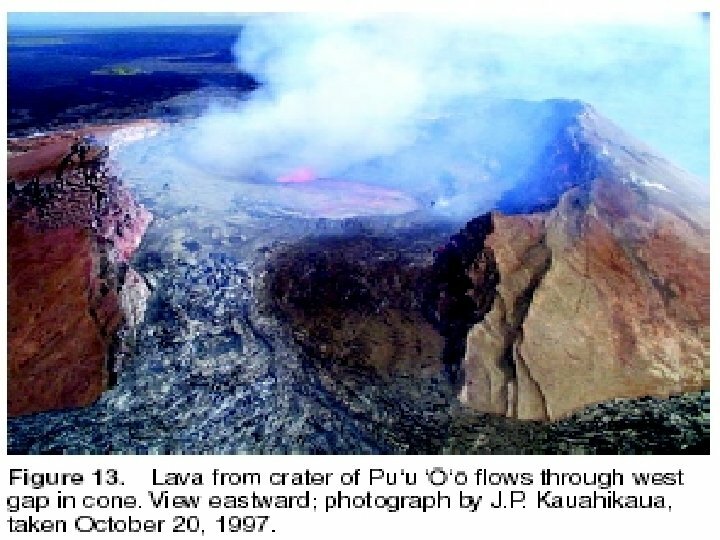 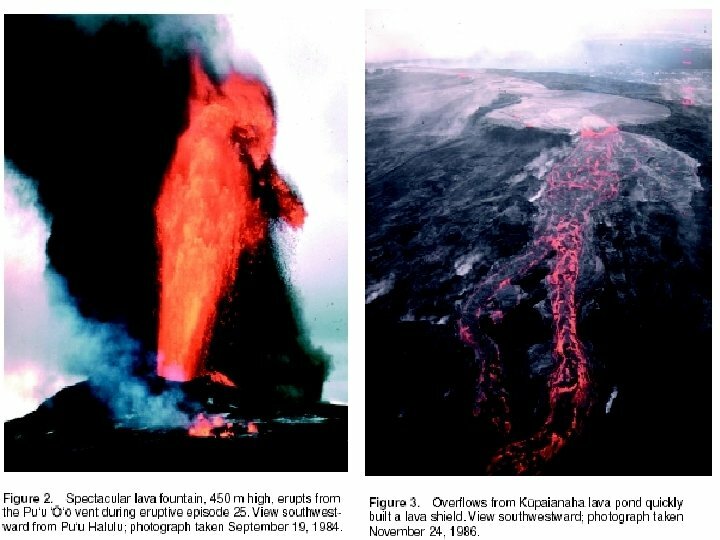 Eruptions of Kilauea are prominent in Polynesian legends; written documentation extending back to only 1820 records frequent summit and flank lava flow eruptions that were interspersed with periods of long-term lava lake activity that lasted until 1924 at Halemaumau crater, within the summit caldera. 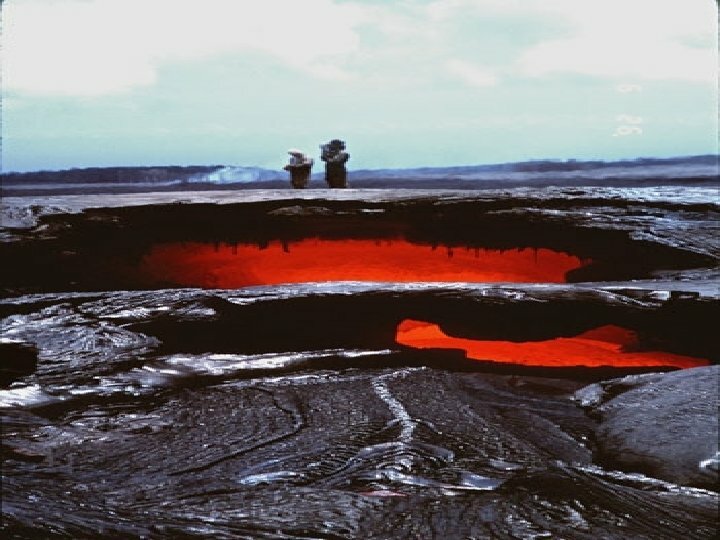 The 3 x 5 km caldera was formed in several stages about 1500 years ago and during the 18 th century; eruptions have also originated from the lengthy East and SW rift zones, which extend to the sea on both sides of the volcano. 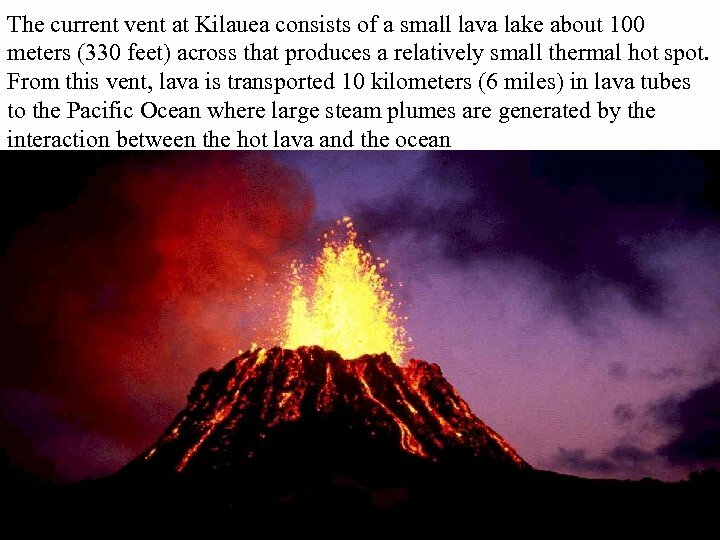 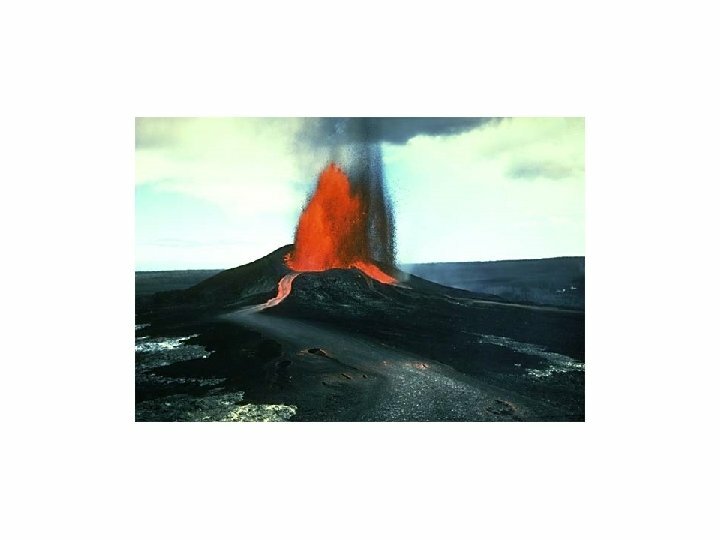 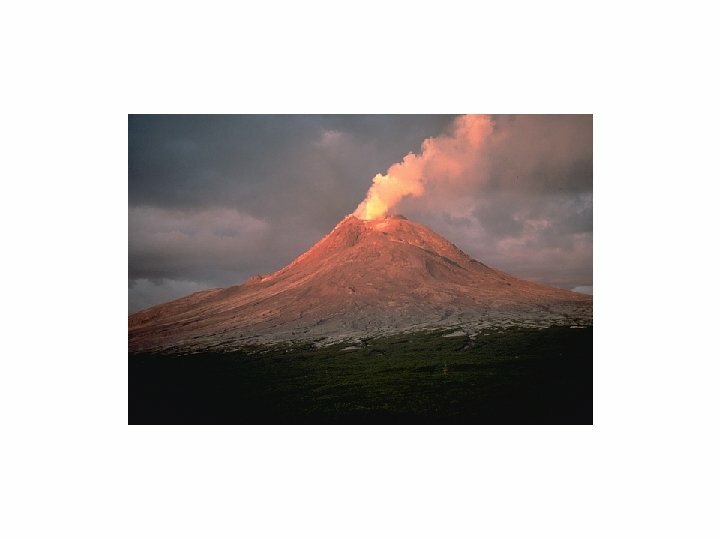 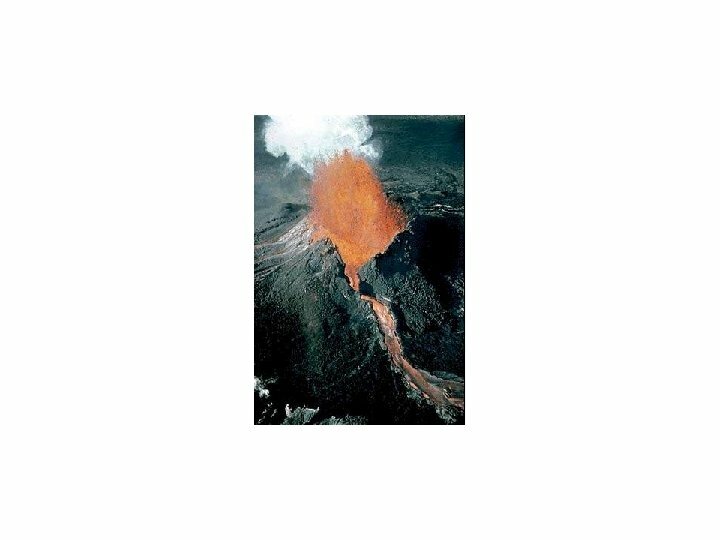 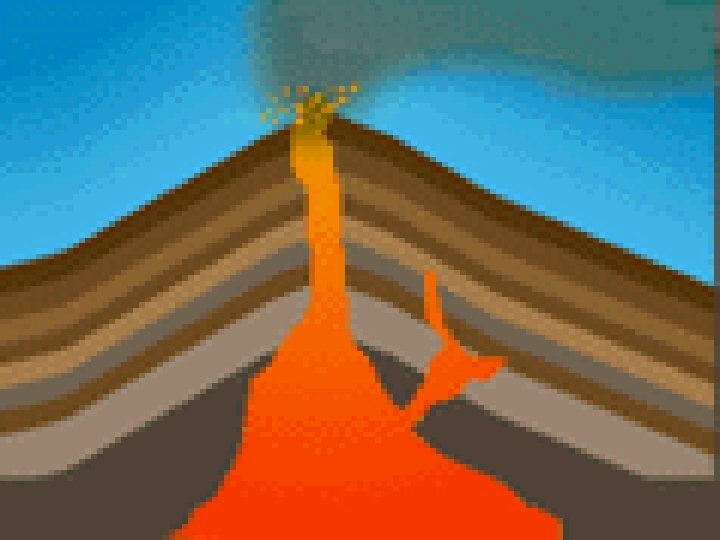 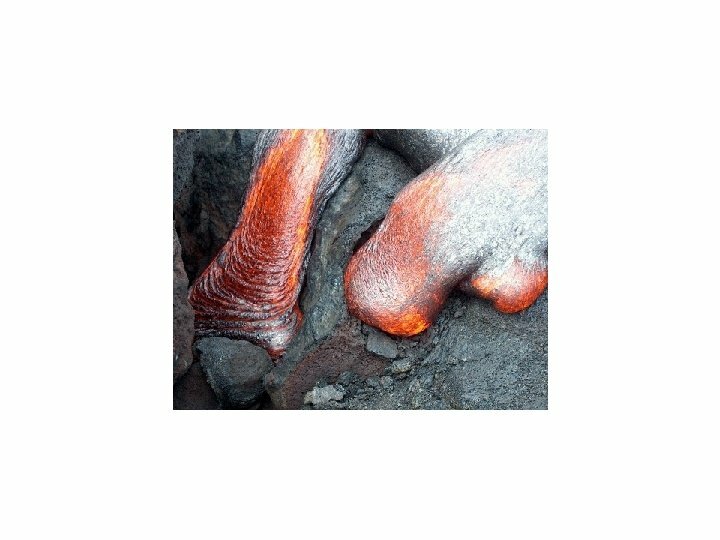 About 90% of the surface of the basaltic shield volcano is formed of lava flows less than about 1100 years old; 70% of the volcano's surface is younger than 600 years. 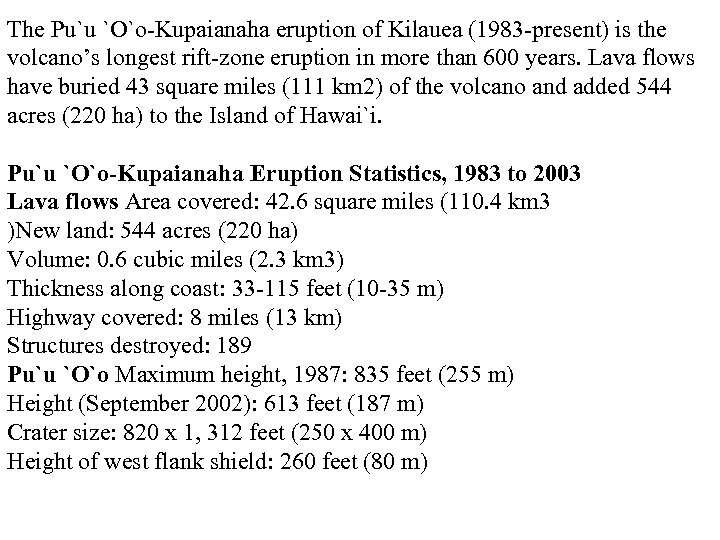 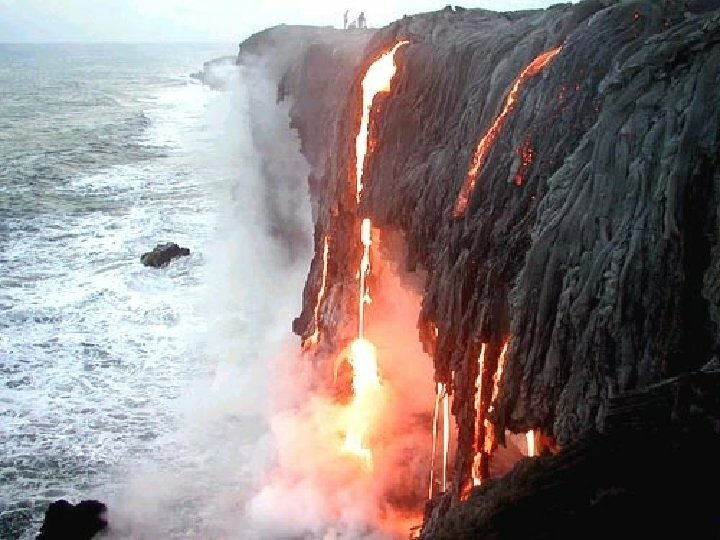 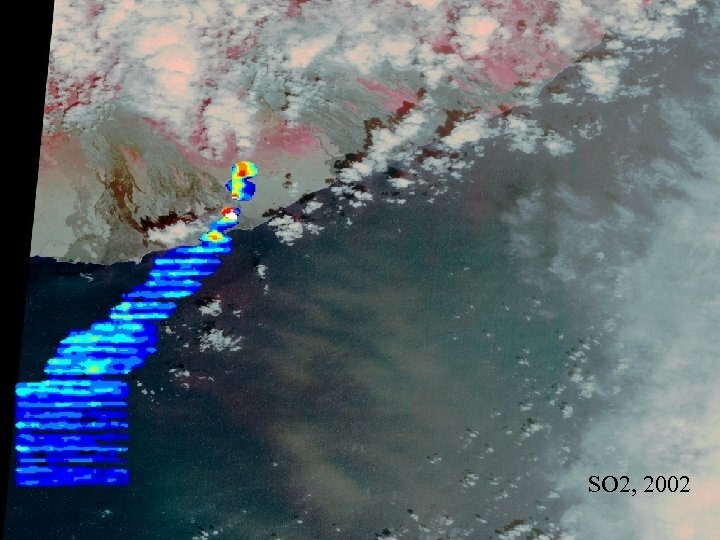 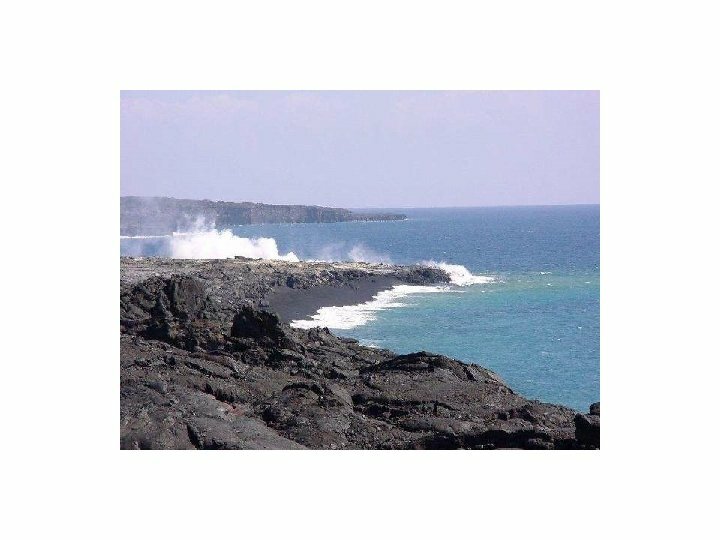 A longterm eruption from the East rift zone that began in 1983 has produced lava flows covering more than 100 sq km, destroying nearly 200 houses and adding new coastline to the island. 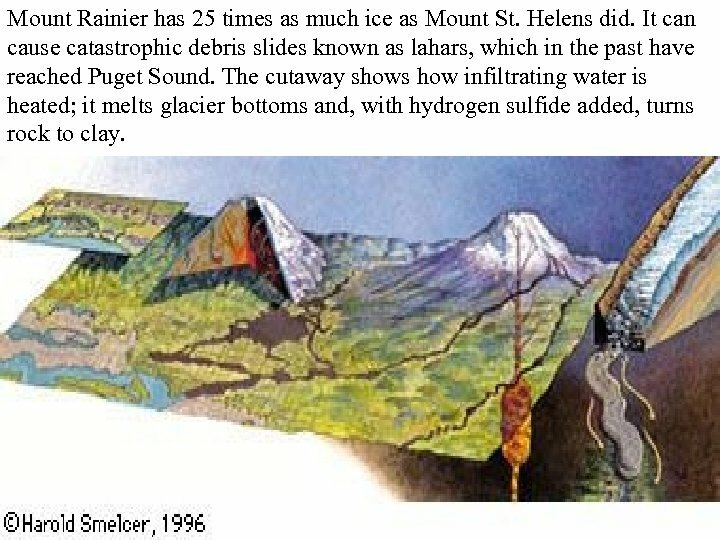 Mount Rainier has 25 times as much ice as Mount St. Helens did. 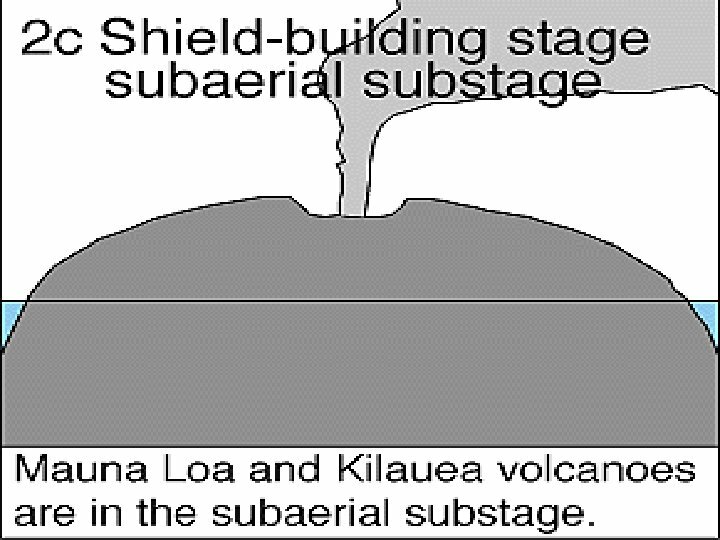 It can cause catastrophic debris slides known as lahars, which in the past have reached Puget Sound. 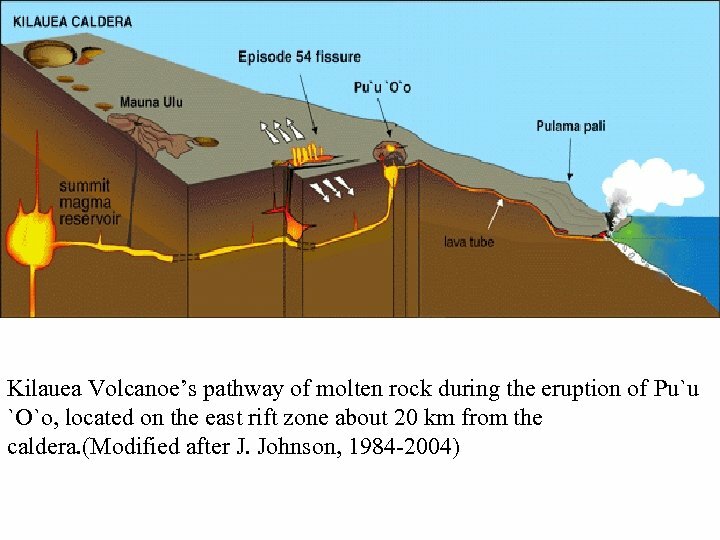 The cutaway shows how infiltrating water is heated; it melts glacier bottoms and, with hydrogen sulfide added, turns rock to clay. 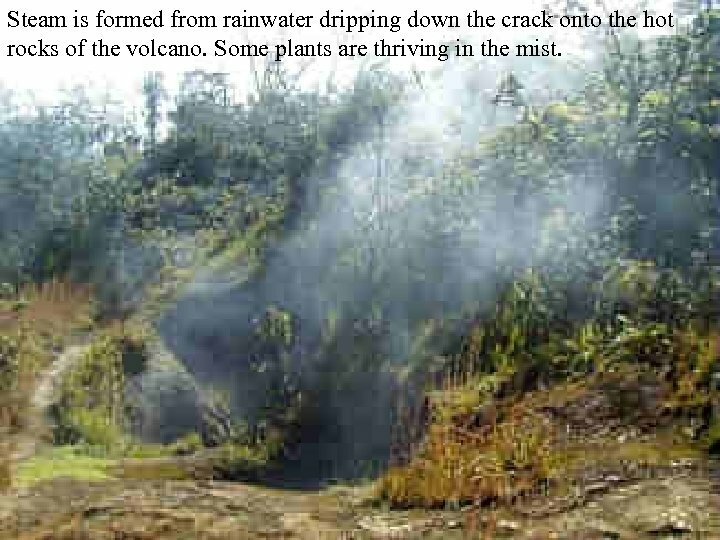 Steam is formed from rainwater dripping down the crack onto the hot rocks of the volcano. 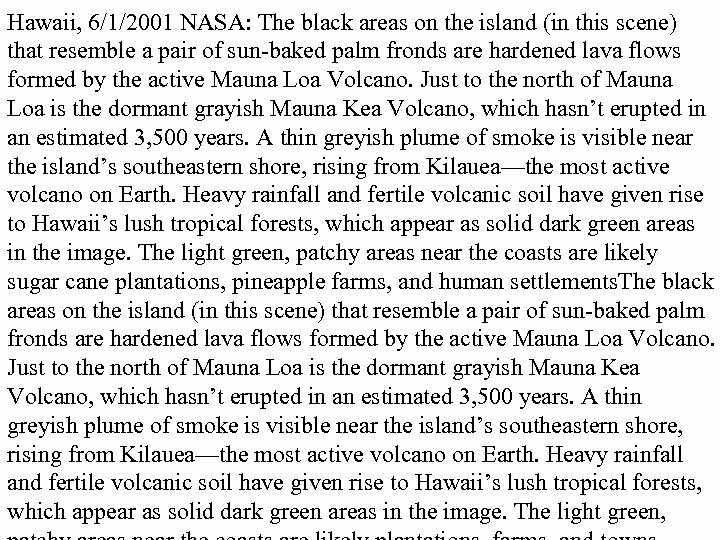 Some plants are thriving in the mist. 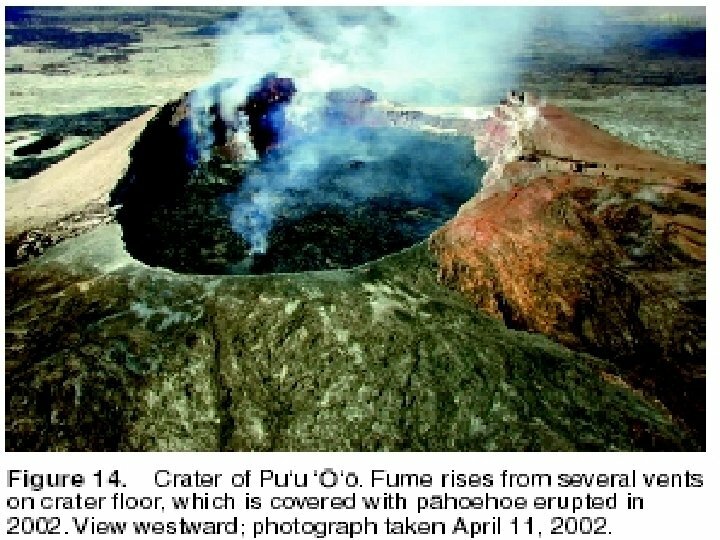 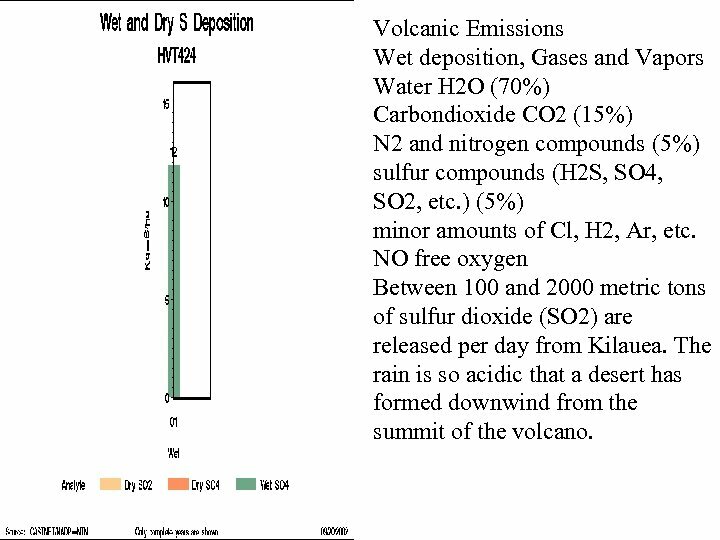 Volcanic Emissions Wet deposition, Gases and Vapors Water H 2 O (70%) Carbondioxide CO 2 (15%) N 2 and nitrogen compounds (5%) sulfur compounds (H 2 S, SO 4, SO 2, etc. ) 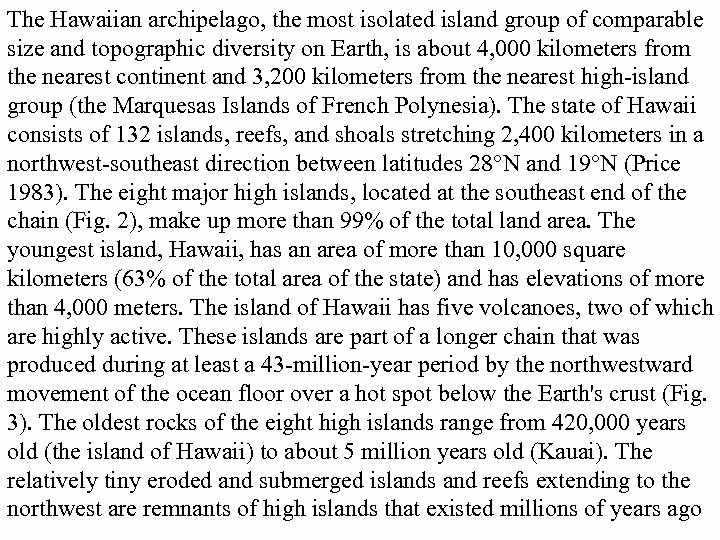 (5%) minor amounts of Cl, H 2, Ar, etc. 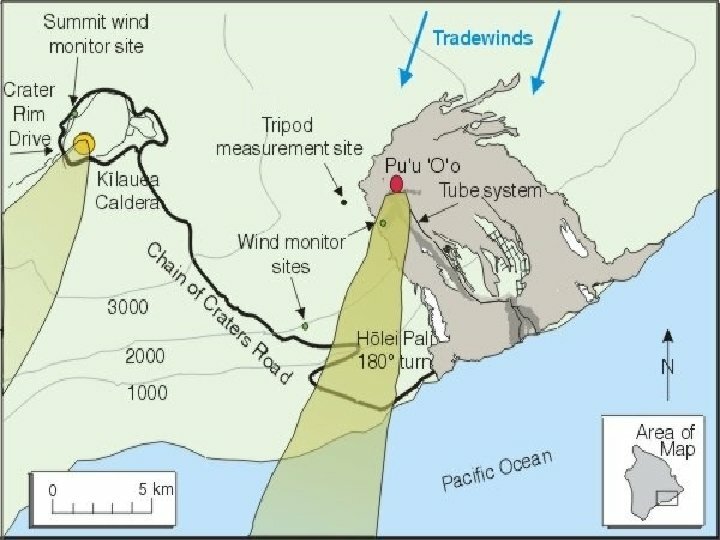 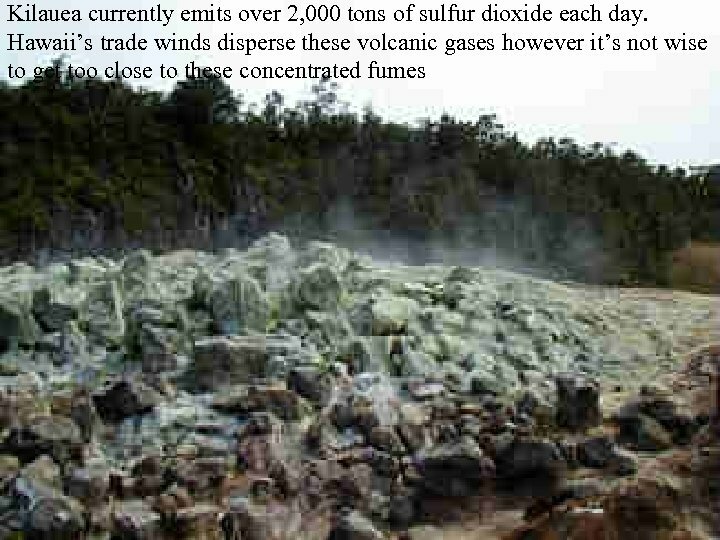 NO free oxygen Between 100 and 2000 metric tons of sulfur dioxide (SO 2) are released per day from Kilauea. 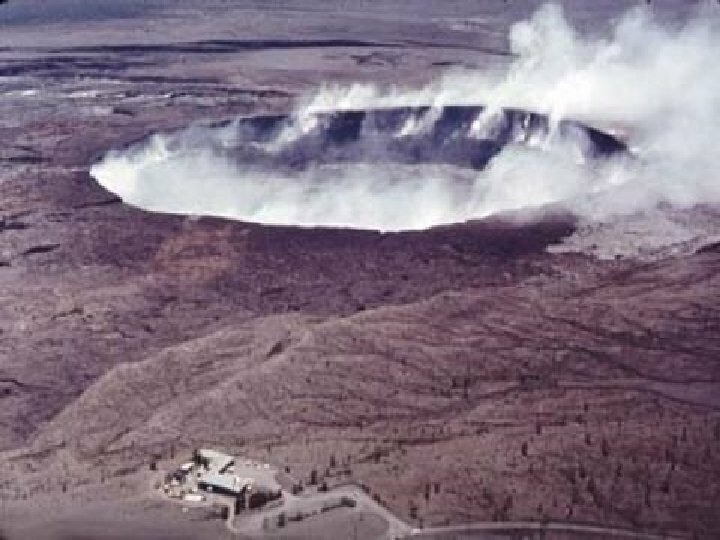 The rain is so acidic that a desert has formed downwind from the summit of the volcano.